b) that the apparently discrete and rule-bound activities we usually consider games are for the most part not the kind of game in question. I am also still happy with the conceit I shared in this regard, the idea of a cosmic, chaotic game that bleeds into every discrete, ordinary game. And I am still playing, still dreaming, still trying to forget the game of the thesis. So I review my own writing here to refine that conceit. Illustrating the concept of the cosmic game, I had recourse to a fine chapter in Deleuze’s Logic of Sense, adopting his distinction between Normal Games and the Ideal Game. What I have been calling discrete or ordinary games, Deleuze dubbed Normal Games, suggesting that they are “mixed‚” — they involve chance, of course, but “only at certain points”; the rest of their play (?) “refers to another type of activity, labor, or morality.” We can think of social activities as games … only because we think of games in the restricted, “mixed” economy of Normal Games that involve the acceptance of rules and a possible competition. That is, normal games always refer their play to a norm that is taken to be serious, outside of the play-sphere. The Ideal Game is Deleuze’s name for this funny thought of the cosmic game or the play of the world. 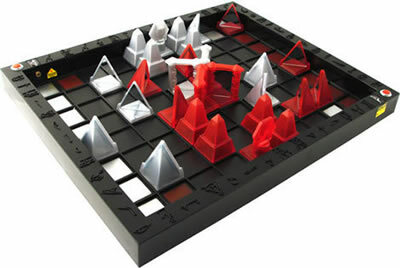 It has no rules and is entirely too chaotic to allow for any skillful use of chance (meaning the mechanical consequences of well-executed moves). Every Normal Game flirts with chance to some degree or another, and plays, Deleuze wrote, at mastering it. And if one is serious one might think one has. My problem with Deleuze’s version of the Ideal Game is that he states, first of all, that it can’t be played “by either man or God.” Worse, “it would amuse no one.” He writes that, ultimately, “it can only be thought as nonsense.” I wonder why this did not suggest another idea of play and of amusement, such that, not negating but simply and nonsensically contradicting the first two claims, the Ideal Game can’t but be played by people and Gods (if any); and it not only amuses everyone but is precisely the Amusing as such! Both aspects of this double ojection now strike me as silly. First, to invert the claim that the Ideal Game can’t be played by either man or God was a clumsy move. It would have been more interesting, and also nonsensical in a more modest, more subtle way, to agree. I now think Deleuze was showing that, from the point of view of the Ideal Game, both humanism and divine anthropomorphism are rendered ultimately impossible. From that perspective, God and Man never really play. They are immediately transformed, cancelled, rendered radically other, so that these words turn out to be signs of stranger, more wonderful processes. Insofar as such mirages have any consistency (I won’t write reality), they name players of normal games (Creation, anyone? ): mixtures, as Deleuze wrote, of play and work, chance and rules well followed. Is anyone surprised? God and Man are always primarily at work. That is what History teaches. What about Deleuze’s second statement: ” it would amuse no one”? I held out the possibility that perhaps the Ideal Game “is the Amusing as such.” Now I want to ask: amusing for whom? Not for Man or God, as I think I’ve established – they work and play in their normal games, and work at least cannot be amusing. It is serious, rigorous, painful. (I leave it to you to discern if even the play component of normal games is ever amusing). So who is amused? Personne, as it is said in French: anyone, nobody. But that anonymous person is a mask to be sculpted, not a pre-existent fact. It would have been more interesting to agree, again, and draw this conclusion: if the Ideal Game were the Amusing as such, then some minimum permanent amusement would have to be guaranteed. That is, the Ideal Game would have to be conceived not as the impossible Idea of Play but as the all too possible guarantee of amusement. I think that is also called heaven. Or the dull utopia of our more secular, still silly friends who think that the play of the world is progressive and make plans accordingly. Is anyone surprised? Amusement is not guaranteed. That is what History teaches. How could it be more interesting to agree that the Ideal Game amuses no one? This is what is most difficult. The Ideal Game, if one accepts that its play dissolves God and Man in chaos, is not amusing because it can never be determined ahead of time who is amused or what is amusing. We can go on playing normal games, or attempt to open them up to their Outside, the Ideal Game. Of course, they are already so opened. The question is to know it, to show it, and to play according to this intuition. The success of this operation is no more guaranteed than victory in a normal game, but it is far more desirable. There must be an unevenly distributed virtuosity in the ability to know and show this opening, to act on it. (And this is perhaps the only way that desire and virtue may be related). More straightforwardly I mean that it is not only dull, but impossible, to be God or Man outside of one or more normal games – so the bleed is how we become someone or something else, whoever or whatever is amused. Becoming whoever or whatever is amused by the Ideal Game is necessarily uncertain. It is the most delicate of processes, the most unpredictable of undertakings. In these mutations we might discover what I consider to be the sole healthy use of hope: we may hope for amusement, hope to become those who are amused (and amusing?!). An aside for the curious: how could exposure to the Ideal Game transform the sense of our old motto “ni dieux ni maître“? I suppose its destructive intuition remains intact. It was always a matter of playing certain historical or political games so that Gods and Masters were excluded. But its rage is perhaps diffused into a bizarre comedy. Ni dieux ni maître: a title for a play about ridiculous gods, and laughable masters. It is a story of History seen from its underside, of the World Turned Upside Down. I hope that this chaotic reinterpretation is amusing! Hume, in his Dialogues Concerning Natural Religion, arguably sketched out part of it, with his tales of less than Ideal gods: witness the increasingly mad hypotheses of the infant god, the senile god, the 30,000 competing gods, the Spider god of the Spider planet … Are any of these “God”? Can we learn how to act out the rest of the play, becoming those who amuse everyone by laughing at the laughable masters, at power, at competition, at every form of auctoritas? Is it still “Man” we are talking about when we become the manimals that, outside of History, wander the fields of ownness like packs of wolves, flocks of birds, or solitary and proud beasts? My revision of the essay is done. I would like to add one more provocation: the Ideal Game is the only game that truly instructs. Of course normal games teach in some trivial way. One might say that a given game teaches patience, for example, or that another teaches strategic thinking. Maybe so. In the metaphysical register where all of this butterfly-writing is lodged, I would say that, if normal games teach, they teach first, foremost, and perhaps only the mastery of their own play. To say they teach anything beyond their own play is to engage, wittingly or unwittingly, in contemplating their opening up to the Ideal Game. That is to say that normal games only teach through redundancy. As our genial grandmother, Gertrude Stein, wrote: “let me recite what history teaches. History teaches.” Let us not forget that Vico, Hegel, Marx and our other perverse grandfathers, inventors of the concept of History, all set out to define and describe its inexorable laws of development. Let us not forget that the ideal of progress, especially as inherited by the Left, was always taught as the working out of these laws – a massive normal game combining work and chance, but mostly work. Peer if you know how into the outside of History. You might discern that the Ideal Game is impressive. It silently impresses its lessons upon us insofar as we are exposed to a chaos that cannot be thought, only felt. Artaud called it a metaphysics that enters through the skin. Wouldn’t the strangest thing be to take these impersonal lessons, and, impressed, learn the lightness of the self and its masks? Who but the most virtuous among us could claim to have gracefully opened the play of their life to the cruelty of the cosmic game and sculpted the artifice of a person, a mask for this slice of the chaos to wear? Who but the most sober could admit that the slice comes into being with the mask, that personality is local, like the weather? Who but the most delicate could claim to have learned, not in the strictures of normal games of morality and etiquette, but in the midst of chaos, the attitudes of patience, gentleness, or honesty? That chaos is still their raw material and, dare I say, essence? The Ideal Game instructs because it is ultimately all there is to experience. Not a limit, but a pulsating horizon, interminably receding. Becoming one who is amused is almost intolerably gradual. Patience, gentleness, honesty: these are not static qualities of a moral person. They are masks to be endlessly perfected, ways of playing normal games that seek to open their play to the cosmic game with ever greater virtuosity. If one learns anything in one’s life (and, not to be coy, of course one does! all the time!) it is learned in and through participation in the Ideal Game, that cosmic prefiguration of zerowork.